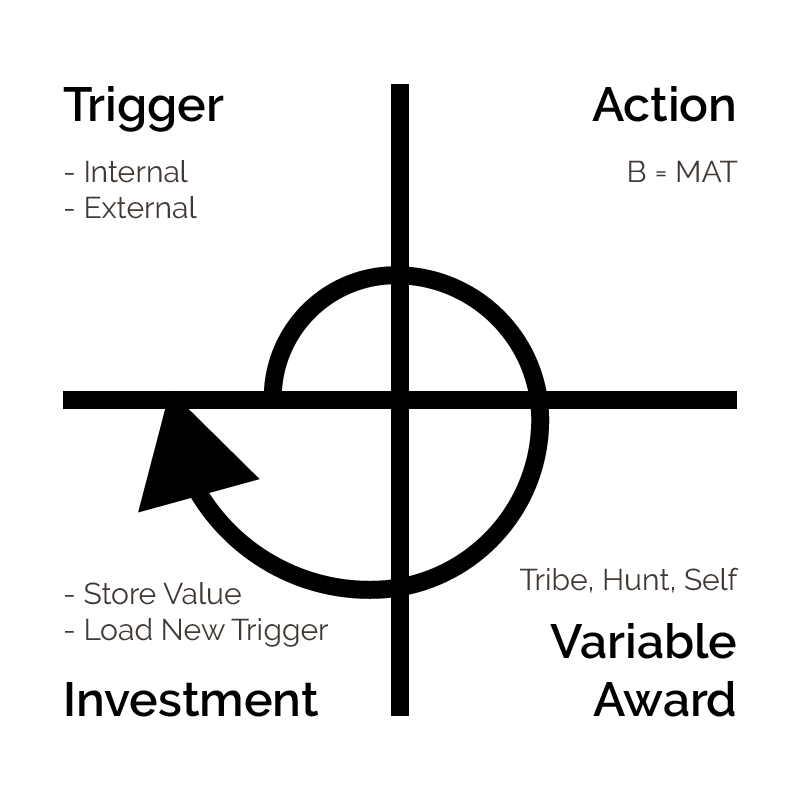 The book, “Hooked: How to Build Habit-Forming Products”, is one of my favorites as it provides a well-structured model in building something people addict to. Impressively, for me, it pointed out the problems I had faced while building new things, and explained reasons behind. This post is my study note of reading the book. Habits cannot form outside the habit zone. Notice: not all the products or services need to form habits, ex. insurance products. External triggers are embedded with information which tells the user what to do next. Internal triggers are attached to existing behaviors and emotions. what people say they want (declared preferences) are far from what they actually do (revealed preferences). To pick from M, A, T: always start with ability. Heuristics are shortcuts we take to make quick decisions. Note: Mental Notes help designers build better products through heuristics. Without variability, we are like children in that once we figure out what will happen next, we become less excited by the experience. The need to acquire physical objects, such as food and other supplies that aid our survival, is part of our brain’s operating system. Their self-determination theory espouses that people desire, among other things, to gain a sense of competency (peosonal form of gratification). Mahalo.com: found that people didn’t want to use a Q&A site to make money; however, Quora: social rewards work. Only by understanding what truly matters to users can a company correctly match the right variable rewrds to their intended behavior. If failed: Reactance, the hair-trigger response to threats to your autonomy. Too many companies build their products betting users will do what they make them do instead of letting them do what they want to do. Experiences with finit variability become less engaging because they eventually become predictable. Notice: Asking users to do a bit of work comes “after” users have received variable rewards, not before. If users are not doing what the designer intended in the investment phase, the designer may be asking them to do too much. Habit-forming technologies leverage the user’s past behavior to initiate an external trigger in the future (reengage the user). In building a habit for a user other than you, you can not consider yourself a facilitator unless you have experienced the problem firsthand. “Would I actually find this useful?” the answer to this uncomfortable question is nearly always no, so they twist their thing until they caan image a user they believe might find the ad valuable. 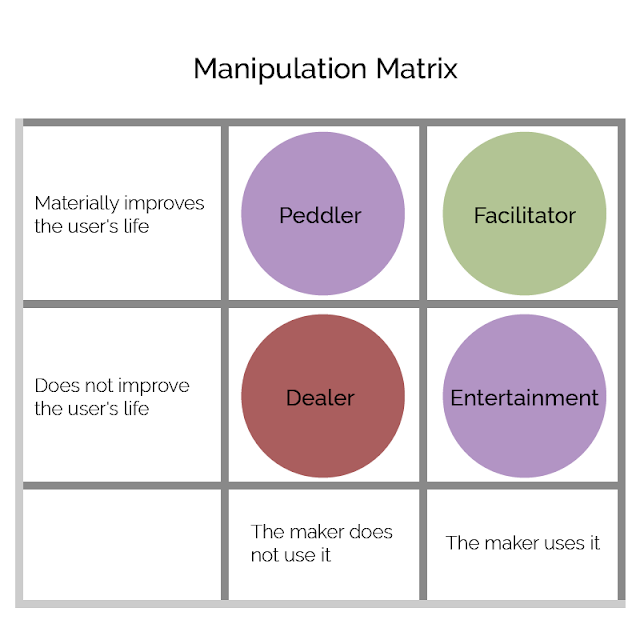 Peddlers tend to lack the empathy and insights needed to create something users truly want. Often the peddler’s project results in a time-wasting failure because the designers did not fully understand their users. Art is often fleeting; products that form habits around entertainment tend to fade quickly from users’ lives. Entertainment is a hits-driven business because the brain reacts to stimulus by wanting more and more of it ever hungry for continuous novelty. The only reason the designer is hooking users is to make a buck. Ex. casinos and drug dealers. Building a habit-forming product is an iterative process and requires user-behavior analysis and continuous experimentation. Dig into the data to identify how people are using the product. Don’t come up with an overly aggressive prediction. Codify these findings in search of habitual users to generate new hypotheses, study the actions and paths taken by devoted users. You are looking for a Habit Path - a series of similar actions shared by our most loyal users. Modify the product to influence more users to follow the same path as your habitual users, and then evaluate results and coninue to modify as needed. Wherever new technogolies suddenly make a behavior easier, new possibilities are born. Many companies have found success in driving new bahit formation by identifying how changing user interactions can create new routines. “Live in the future”: Google Glass, Oculus Rift, Pebble watch, etc. If you only build for fame or fortune, you will likely find neither. Build for meaning, though, and you can’t go wrong. There’s a pain for the fear of missing out (FOMO). 26 percent of mobile apps in 2010 were downloaded and used only once. In the last chapter of the book, the author suggest that we should keep eyes on emerging technologies and seek oppertunities. This remind me a TED Talk, “Bill Gross: The single biggest reason why startups succeed”, where the speaker claimed “timing” is the most important factor of a successful startup company. Both of them hold the same view on believing “timing” is the key of a successful startup. 2. Facilitator for All Team Members? An interesting question popped up while I was reading the manipulation matrix part. The author suggested that it’s better to work as facilitator, so the maker himself/herself will have a deeper understanding of the product. However, in real experiences, this might hold true only in the beginning - when there’s only one person on the team. As the project grows, people join into the team, and it’s impossible that everyone suffers from original problem that the team is trying to solve. That is, an designer of a video game startup company doesn’t have to like playing video games. So, I raised the confliction I found here to one of my friends. She replied that, in a product group, some are facilitators while some are peddlers. For those peddlers, it’s okay that they haven’t experienced the problem the group is trying to solve as long as they agree with the team. That is, the point is whether the team has a same milestone instead of all being facilitators.